Photos of James Moore and a photo of Lavinia Moore. The mounting provided by the photographer says they were taken by Eberhart in Mt. Vernon, Iowa. No dates are provided. Someone wrote the names of James Moore and Lavinia Moore on the mounting below each photo, but I doubt that these were autographs, because it's the same handwriting on both. The 1850 census of Hartsgrove, Ashtabula County, Ohio recorded James(29) and Lavinia (28) with children Sylvia(6), Joseph(4), Aura(3), and Lafayette(1). Some time between 1850 and 1860 they moved to Bertram, Linn County, Iowa. The 1860 census of Bertram, Linn, Iowa recorded James(45), Lavina(35), Joseph(13), Laura(12), Lafayette(9), John(5), and Katy(2). 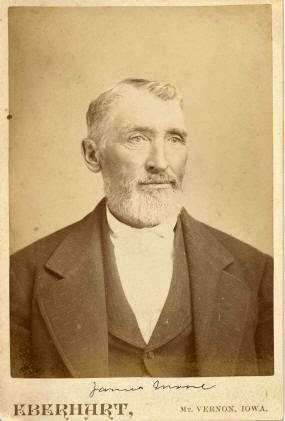 John Moore was my great grandfather. 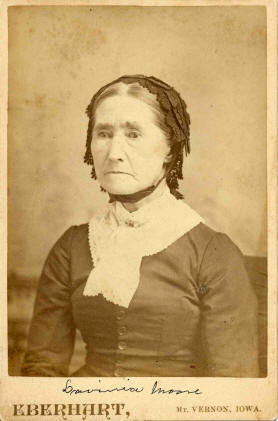 Note that Sylvia is missing from the 1860 census, since she died in 1858 and was buried in the Moore-Skillman Cemetery. The 1870 census of Bertram, Linn, Iowa recorded James(49) farmer, Lavina(48), Joseph(25), Aura(23), Lafayette(21), John(17), Katy(14), and Frances(6). The Moore-Skillman Cemetery page and the Iowa Gravestone Photo Project each show 13 different people buried there. Six of them were children of James and Lavinia Moore: Sylvia Moore, Joseph Moore, Aura Moore Skillman, Lafayett Moore, Frances Moore White, and Minnie Moore. Birth date and census records seem to make it clear that the J. W. Moore who is buried in the Moore-Skillman Cemetery was the same person as James Moore, the father of the above children. I don't know where Lavinia Moore is buried, but I speculate that she remarried after the death of James Moore, and is buried with her second husband.